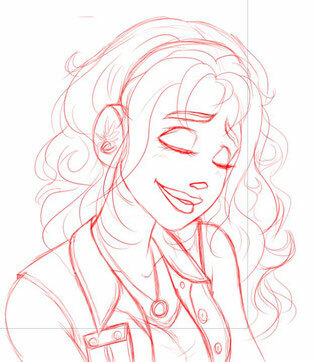 Firts off: Have a sketch of Irma being all calm and Zen. Tada. Now onto the serious stuff. I completely miscalculated how long Page number 6 would take me. It's the first of the Irma feature. Several factors contributed to the delay: learning a new software, writing exams, applying for a new job, starting a new job at a company, lots of family birthdays. All of these factors caused me to have almost no time left to do anything else apart from chores and taking a breather. So when I started the second casting, I just didn't know it would take so long for the page to be finished. However - and this is the learning part - I want to be more patient and try to launch castings only right before that exact page. One page before is simply too unpredictable. I appologize deeply for the long wait, especially for my great casting winners! I really am sorry and I hope you can stick with me a little longer. I am already working on the second page (the one you've been casted for) but of cause I do have to finish the first one first. I will try to get a better timing and be more patient next time so it's the best experience for everyone.